SHIRAZ, April 17, 2010 -- When Persian tribal carpets first began to reach 19th century Europe, they often got a mixed reception. One problem was where to put them. They were typically of small size at a time when putting a large carpet across a big living room floor was the preferred choice. 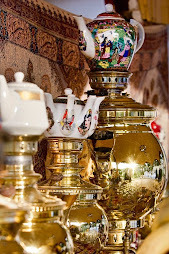 And their tribal designs were not considered particularly refined, at a time when "civilized" elegance was the style. 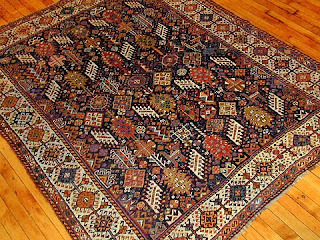 So, Persian tribal rugs -- like Turkmen tribal rugs and many others with bold geometric designs – often found themselves relegated to the "man's" room in the house. The unspoken rule was: tribal rugs in the study; floral workshop rugs in the boudoir and parlor. But if there were misunderstandings about where to put the rugs, perhaps the greatest misunderstanding of all was about what to call them. The name "Persian tribal," of course, meant nothing because it neither distinguished between the rugs' styles nor told anything about the people who wove them. In fact, the great majority of the rugs were not made by Persians – in the sense of Persia's majority people, the Fars – at all. They were made by peoples as diverse as Turks, Arabs, Kurds and Baluchs. 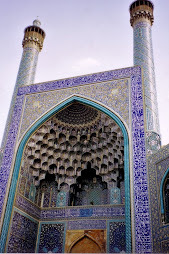 For millennia, they too have inhabited Persia but they have kept their own languages, cultures, and artistic traditions. Currently, these minorities make up some 49 percent of Iran's inhabitants. It was only with time that European rug owners began to realize that the new patterns on their floor were a window into a fascinating world of tribal and nomadic folklore that remains very much alive in Iran today. Here is perhaps the most famous tribal rug of the turn-of-the-last century. 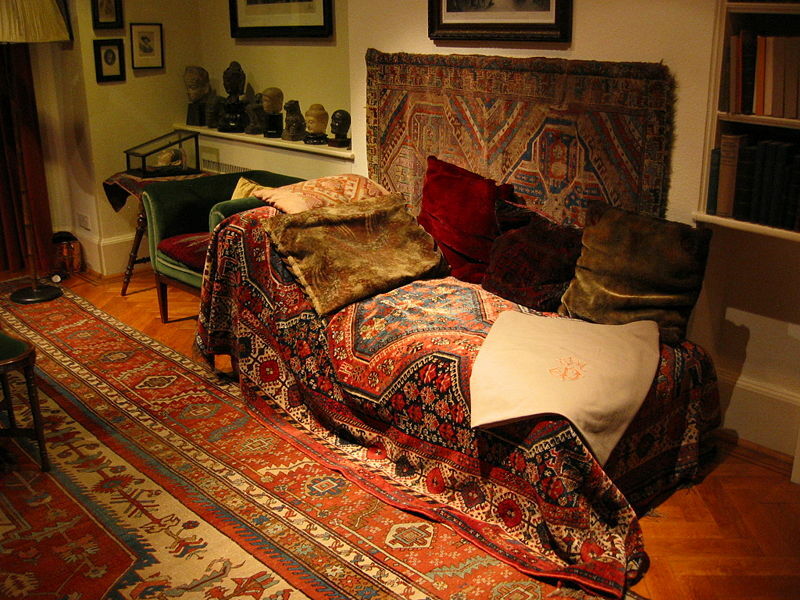 It is the rug used by Sigmund Freud to cover his famous "couch" in Vienna, where much of his pioneering research in psychotherapy was done. 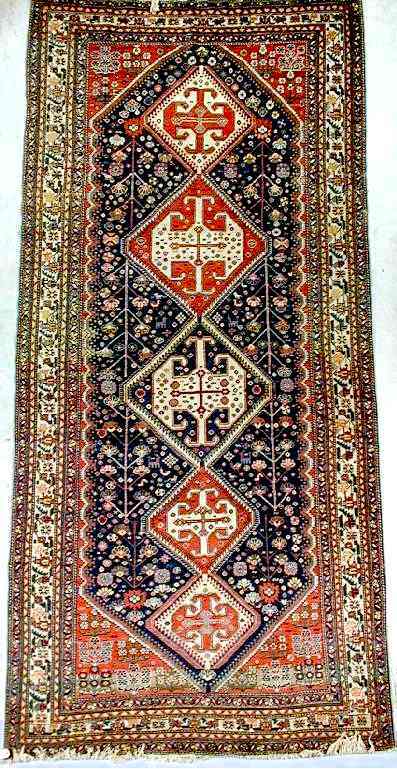 The rug is characteristic of the Turkic-speaking Qashqai (or Gashgai, Kashgai), who are one of Iran's largest tribal confederacies. 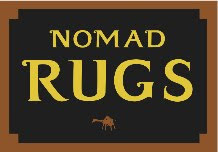 Their rugs are filled with symbols, both abstract and semi-naturalistic, that derive from the nomadic weavers' ancient traditions. Freud believed these symbols, with their unconscious suggestions, could help create a mood in which his own patients could relax and more easily explore their subconscious memories. The rug still covers his couch, which he moved to London after Nazi Germany annexed Austria in 1938. 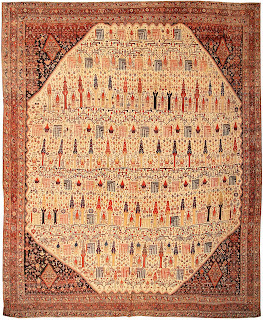 Here is another Qashqai rug with rows of trees interspersed with vines. 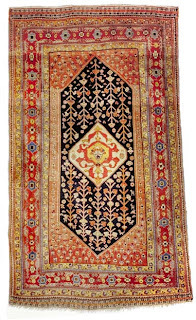 The carpet is available to collectors from the Nazmiyal Collection in New York. The Qashqai, who live in southwestern Iran, were one of the best organized and most powerful nomadic peoples in Persia during the 19th century, when they often forcefully fought off government efforts to control or settle them. Their annual migration was, and is still, the largest of any in the country. In their migration, the Qashqai move from their summer pastures in the mountains north of Shiraz to winter pastures south of the city. The trip, which covers some 500 km (300 miles), takes them up and down steep mountain slopes as they descend from their winter camps at altitudes as high as 2,500 meters (10,000 feet) and move southward toward sea level. Their life of nomadic pastoralism is told in the symbols they weave into their rugs. The symbols range from human figures to four-legged animals, birds, trees, and flowers, as well as a wide range of geometric shapes. Some of their carpets are so filled with such motifs that they almost look like a catalog of the objects in their daily life. Below is a carpet is typical of the Shekarlu, one of the tribes in the Qashqai confederacy. In it, the highly recognizable objects include wooden combs used by tribal women for their hair. The combs, as symbols of a bridal trousseau, also stand for marriage and happiness. The Qashqai consider themselves Turks and call all the other inhabitants of Iran "Tajiks." But their confederacy itself is a conglomeration of clans of different ethnic origins, including Luri (or Lori), Kurdish, Arab and Turkic. Their common language is a form of Turkish closely related to that spoken in Azerbaijan. Just when Turkic-speaking nomads first moved into Persia is unknown. But most historians trace the first large-scale movement to the time of the Seljuk conquests, around 1,000 AD. That was when Turkic tribes in western Central Asia were migrating in mass further west and south, into modern Iran, Iraq, and Turkey. The tribes -- from the Oghuz branch of the Turks -- shared similar cultures and languages and many of those ties survive to this day. They can readily be seen in the many shared motifs on rugs across the Turkic world. 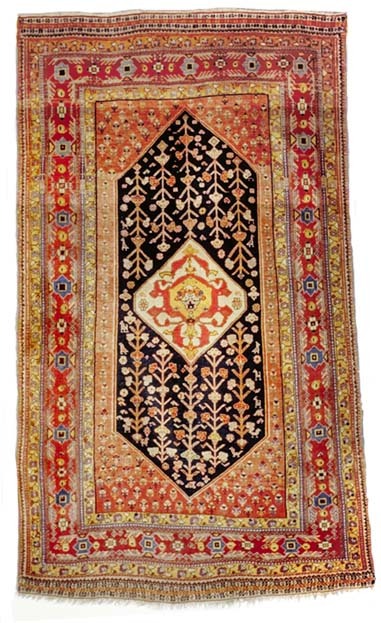 Here is a carpet woven by the Amaleh tribe of the Qashqai confederation. Over the centuries, the Qashqai and other tribal confederacies often played significant roles in ruling the country. Persian shahs routinely took power with the military backing of the Turkic tribes then ruled through the bureaucratic power of the Persian – Fars – elite. The power of the tribes was not finally curbed until the 1930s, when Reza Shah (who re-named Persia as Iran in 1935) deployed a newly modernized army, with armored cars and planes, against them. The Qashqai were starved into submission when the army blocked the narrow passes on their migration route across the mountains and the nomads' riflemen were unable to dislodge them. Since then, many of the Qashqai have settled, joining other members of their confederation who over the centuries have taken up village life. 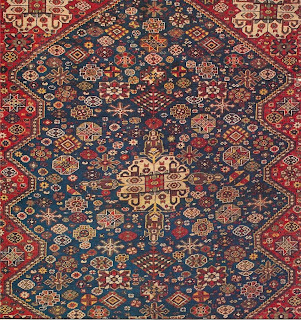 It is partly because tribal confederacies like the Qashqai have always had both nomadic and settled components that some of their rugs are town or city weavings. 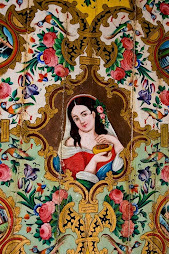 Much of the Qashqai's workshop weaving is associated with Shiraz which, because of the nomads' twice yearly migration around it, is the political and economic center of their life. 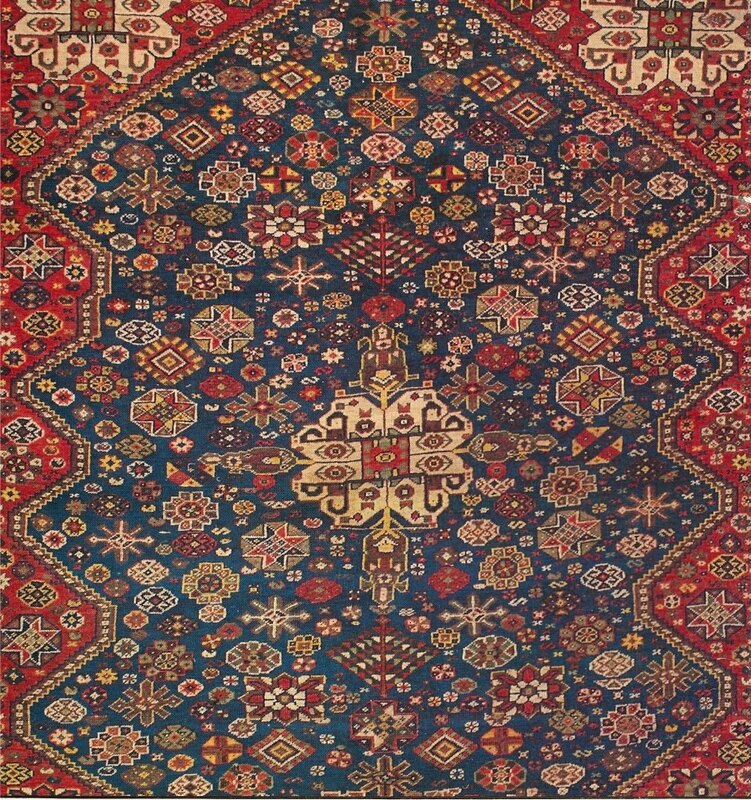 So many Qashqais' rugs are sold in the Shiraz bazaar that their weavings, particularly the simpler ones, are often simply termed "Shiraz" carpets. The Qashqai are hardly the only nomadic and tribal people who have became well-known in Europe through their weavings. Another is the Khamseh tribal confederacy, which neighbors the Qashqai to the east and is considered to be Arab. 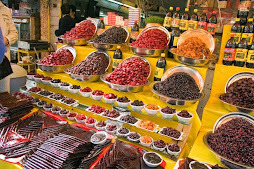 It trace its roots to Arab nomads who moved into Persia from the Arabian peninsula well before the Islamic conquest. But their confederacy speaks no single language and its members, who have banded together for strength, have diverse ethnic origins. To north and west of the Qashqai are two more major tribes, the Luri and Bakhtiyari. Both speak northwest Iranian languages close to Kurdish and their members have diverse ancestries. Here is a picture of a Lur taken around 1921. 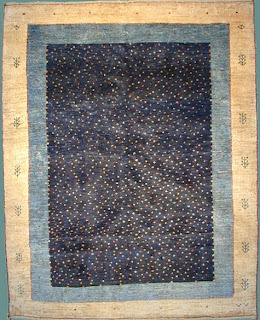 The photo at the top of this article is of the field of a Luri rug. It shows the love of highly detailed symbols that is common to all the confederacies. It is impossible here – or perhaps anywhere – to list all of Iran's tribes. Even today, despite heavy government pressure to settle everyone, nomads can be found in all but two of Iran's provinces -- Kurdestan and Yazd. But how much any of the tribes today weave for themselves rather than for the world market they first began to conquer in the 19th century is another question. Since then, nomadic weavings from Iran and elsewhere have steadily adapted to non-nomadic homeowners' tastes. An early response was to weave multiple and more elaborate borders, to create more varied looks. So much so, that multiple borders became a tell-tale sign of later nomadic weavings throughout the carpet belt. In more recent decades, the Qashqai and neighboring confederacies have had great market success by simplifying one of their traditional rug types -- the thick-piled Gabbeh -- to an ever more minimalist look. The new Gabbeh is composed of just a few tone-on-tone colors and a scattering of tribal motifs or accent points. The evolution of the Gabbeh tells the story of how the global market looks to nomadic weavings for innovation and change, despite the fact that change is foreign to the timeless world of the nomads themselves. Another excellent post. Very informative. Brilliantly written,informative and accurate.Qashqai are my favourite of all persian rugs.Awesome post. It's great to see the Freud image in color...the Qashqa'i piece really glows. That's a pretty good Anatolian Kirshehir 2-medallion rug on the wall, too! Wonderful advice, The illustration and photographs are so helpful. all carpets are very beautiful. thanks for the nice suggestion!!!!!! I really enjoyed it a lot. This is a generic and informative post about Qashqai rugs. Amazingly constructed each and every detail with the proper blend of images. 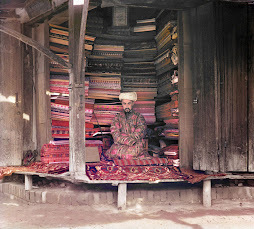 Such an informative post about the Antique carpets rugs and types of carpets in india. Fine, new naturally dyed rugs. Purchase online or at our San Francisco gallery. Can Caucasian Carpets Make A Comeback In The Caucasus? The Antique Carpet Trade: "It's More About What People Feel Than What They Need." Were Animal Design Carpets Europe's First Favorite Rugs? Can Europe's Tapestries And Village Rugs Survive The Global Carpet Competition? Can Modern Weavers Revive The Classical Carpets Of The Ottomans? Can Caucasian Rugs Make A Comeback In The Caucasus? How Traditional Are Iran’s Modern Gabbehs? What Rugs Will Be Collected In 2101? "Although there is much war in the world today due to differing cultures and ideas, textiles are something that all peoples have in common. In places as diverse as Turkey and China, Europe and America, Egypt and the Caucasus, people have been weaving textiles, using similar techniques, for thousands of years. This is a common heritage for all peoples; we cannot characterize what we have here as only 'Turkish culture'; it's not, it's an international culture, handed down to us by our grandparents and their grandparents before them. Carpets are a meeting point for all peoples of the world." 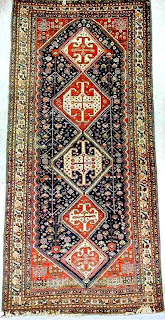 "In trying to think and talk about carpets, I find myself constantly comparing them with music ... carpets made by the nomads and tribeswomen have the character of folk music ... the cottage-made carpet is like the performance of a solo entertainer with a repertoire of popular and traditional songs ... in contrast the workshop carpet, especially the court carpet, resembles a concerto." "Oriental carpets have been recognized as prestigious furnishing in the West since the Middle Ages. In many ways, they represent the epitome of Western concern with alien things – especially utilitarian alien things. Carpets entered the Western cultural arena as a rare item of interest and eventually became a commodity. But commoditization does not adequately explain their continuing success in the market or the special attention they receive from collectors." Combine 1 cup whole-wheat flour with a pinch of salt, 2/3 Tablespoon of olive oil, and ½ cup water. Mix to form a dough and knead for 15 minutes. Coat the dough in 2/3 Tablespoon more olive oil, and let rise for 1 hour in a covered bowel. Separately, mix ½ teaspoon each of ground cumin, paprika, and tumeric into 1/8 cup olive oil. Divide dough into four pieces. Roll each into a large flat wafer and brush the surface with the spiced oil. With fingers, curl up each of the wafers tightly into a long tube and then, curl the tube into a spiral to resemble a cinnamon roll. Roll each spiral into a large flat wafer again. Cook like a pancake for about 4 minutes, turning once, in a hot, ungreased frying pan. Serve immediately.